Saint Patrick Catholic Church, as a parish within the Seattle Archdiocese, follows all policies established by the Archdiocese of Seattle to ensure a safe environment for everyone who comes to our parish. There are requirements for those wishing to volunteer and support the parish in carrying out the mission of the church. These requirements help ensure a safe environment for all. Learn more about the volunteer training requirements established by the Archdiocese of Seattle. All volunteers are required to read and sign the Policy for the Prevention of and Response to Sexual Abuse, Code of Professional Conduct, and Reporting Suspected Abuse of Minors and Vulnerable Adults. All who serve children, youth and/or vulnerable adults are required to complete a course called “Protecting God’s Children”. This course may be taken at any location and is valid within all parishes of the Archdiocese of Seattle. Individuals will be notified by VIRTUS Online when it is time to take an online refresher course—every three years. All current employees and volunteers who have already completed the Safe Environment requirements were automatically transferred into the new VIRTUS database. Those who have already attended a “Called to Protect for Ministries” class will not be required to take the VIRTUS foundation class, “Protecting God’s Children”. These individuals will be notified by VIRTUS when it is time to renew their background check and/or take an online refresher course—every three years. Protecting God’s Children— the training for new volunteers is offered periodically at Saint Patrick Catholic Church & School. Send us an email to learn about upcoming training dates. To attend this class you must log-on to VIRTUS Online to register and establish an account with the Seattle Archdiocese and follow the steps to becoming compliant with all Safe Environment requirements. Background checks are required of all church personnel (clergy, staff, volunteers) who work with children, youth and vulnerable adults every three years. Screening is also required from any volunteer with access to cash, checks or other negotiables. After a volunteer creates a profile on VIRTUS, the individual will be notified by VIRTUS when it is time to renew their background check. Every three years, after completing the Protecting God’s Children course on the ground, volunteers must complete an web-based refresher course. The online training lets participants take the class at their convenience. The Church calls people to the responsible stewardship of their time, talent and treasure in support of the Church. This often takes the form of volunteering for a specific lay ministry, most of which are liturgical, catechetical, or involved in pastoral care and social justice. Liturgical lay ministries include parishioners who take Holy Communion to the sick and homebound, ushers or greeters who direct the seating and procession of the assembly. Catechetical lay ministries include catechists for Catechesis of the Good Shepherd, Children’s Liturgy of the Word, ministers who lead RCIA catechumens on Sundays, retreat leaders, youth group leaders, and organizations like Cub Scout, Boy Scouts and Girl Scouts. Saint Patrick Catholic Church has a vibrant parish life with over 50 active ministries. Which one is God calling you to serve? Learn more about Stewardship of Talent and discern your call prayerfully! All ministries and programs need us as Christian stewards to answer the call of Christ and live a stewardship way of life by share our talents with others through ministry and programs. Click on the links above to learn more about the ministry in general. Scroll down to learn more about the current specific needs of the ministry. 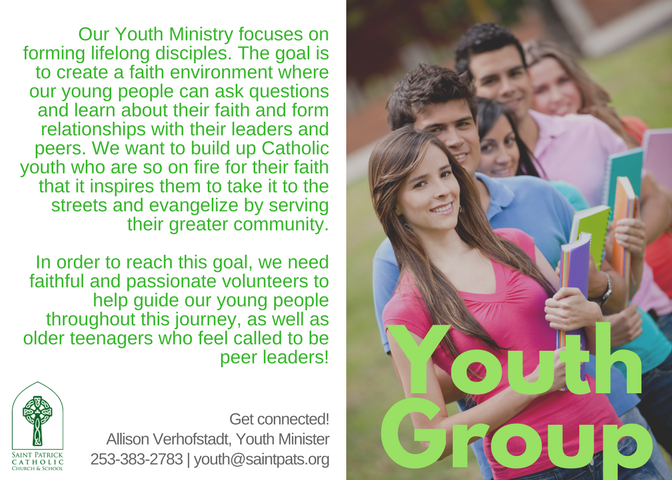 I want to help form lifelong disciples! 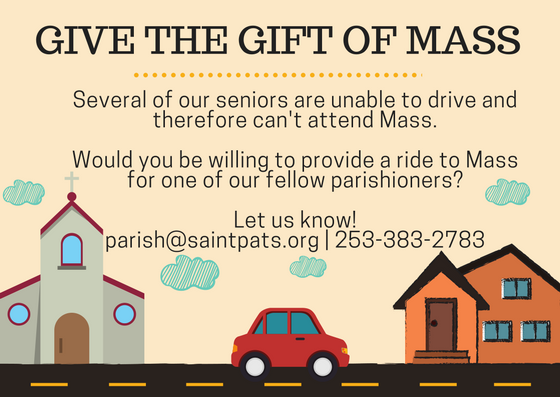 Several parish elders, who attend the Senior Ministry sponsored First Friday Mass and luncheon need a ride to the church. Mass starts at 11 A.M. and is followed by lunch and a program which ends at 1:30 PM. Can you provide a ride? In addition, many parishioners need rides to weekend liturgies. Do you have extra room in your car? The Mass and luncheon leaders are looking for volunteers to help with table setting, serving lunch and after lunch clean up for the Senior Ministry’s first Friday gatherings. 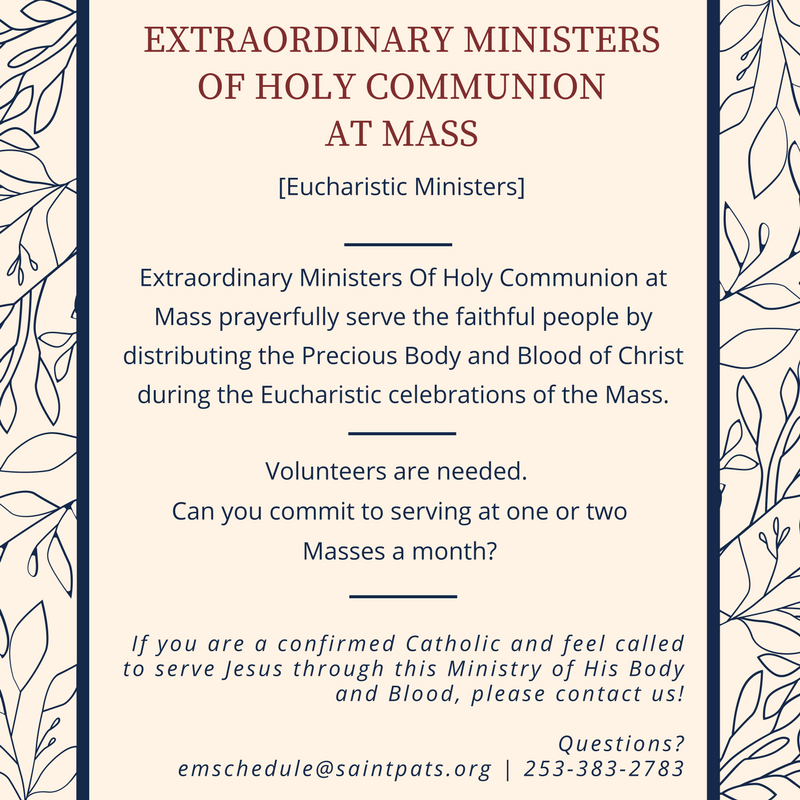 This is a great opportunity to server our parish elders who have served the parish faith community for so many years. For the many parishioners who are sick or homebound, the hardest part is often the inability to get to Mass. That’s why the ministry of those who take the Eucharist to these folks is so important. 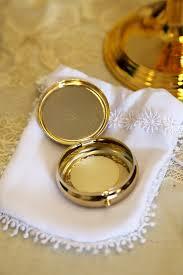 Are you interested in taking the Eucharist to our parishioners who are sick and homeound? I want to bring Christ to the sick and homebound! Sunday Social Hour is more than just coffee and donuts. Would your ministry or program like to host Sunday Social Hour? Families are invited to host Sunday Social Hour too! What a wonderful way for your family to share in fellowship with their parish faith community. A team of families can collaborate to host too. There is no cost to you, but the fulfillment experienced in serving others is tremendous.